We have done a lot of work this year in conjunction with our school improvement plan regarding helping improve children's attitudes and achievement in math. Part of encouraging a mathematical mindset has involved communicating the message to children that we believe in them and know they are capable of amazing mathematical work. 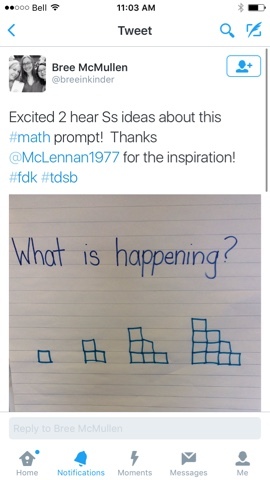 Recently we have introduced some interesting math problems to children and it's really encouraged some deep reflection on my part as an educator, especially when considering the types of questions I offer to children and how I support and scaffold authentic problem-solving and mathematical work in our classroom. Take this problem for example. 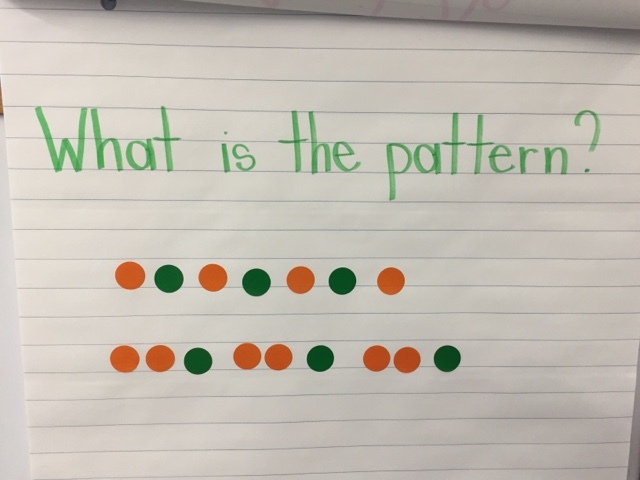 Previously I would have provided this type of patterning prompt during whole group time (probably in our morning message) to children and encouraged them to identify and continue the pattern in each example. I might have then provided the round stickers to children and invited them to create their own simple and complex patterns. When I think about this type of activity, it's satisfying what I was hoping to do (which is explore and create patterns) but I am not really sure that it's as challenging and open-ended as it could have been. After reading Jo Boaler's work on mathematical mindset I've been revisiting the types of problems and math situations we introduce to children. Yesterday I asked the children to consider what they notice about the following figures. We spent the first day discussing what we noticed and today we really delved deeply into the problem. We discussed with children what a robust math task is, and how we can spend a lot of time slowly and deeply thinking about a problem. We don't have to think of the answer right away, and we might all see and think something different about the problem. 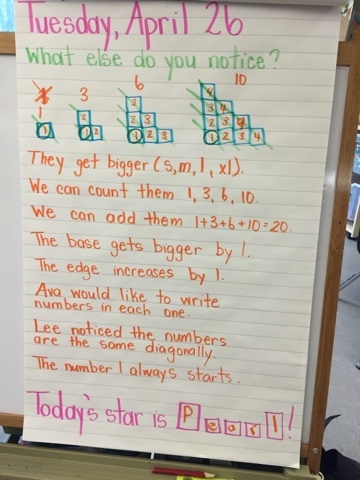 If you examine the children's responses today, you'll notice that they include patterning, measurement, number concepts, and addition in their observations of the growing figures. Some children also considered what was happening if they looked at the figure to the right first, and went right to left. They observed that meant the size and pattern was decreasing instead of increasing. Our conversation was so interesting and we are inspired to revisit this again tomorrow, hopefully using real blocks to actually build a model of this problem. By observing, discussing, writing and representing the problem we are differentiating the math and providing multiple entry points for children into the problem. We are on the same path towards deep math understanding and it's an incredibly exciting place to be! We like to share what we do in our classroom using social media and often tweet about our learning. It was very exciting to get a response from another kindergarten class who is planning on exploring the same problem we did. We are hoping to tweet back and forth with this class so we can share what we observed about the math figures and learn what they notice. We can work together to collaboratively understand the math situation on a deeper level and use technology to help us communicate! Math is about collaboration, not competition!